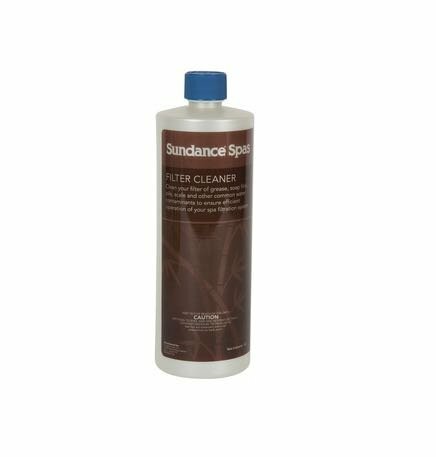 Sundance Spas Filter Cleaner. The filter in your spa is very important. Maintaining a clean filter helps extend the life of your spa. This liquid product greatly improves filter life and efficiency. It is specially made to cleanse suntan oil and grease, as well as scale and mineral deposits from spa filters of all types: cartridge, sand and D.E. Regular use of this product will assure proper filtration. Item will arrive with spray nozzle detached and cap on bottle. Specifically made to cleanse suntan oil and grease as well as scale and mineral deposits from spa filters of all types. Works on all filters: Cartridge, Sand and D.E. If you have any questions about this product by Sundance Spas, contact us by completing and submitting the form below. If you are looking for a specif part number, please include it with your message.